The Vietnam Association of Realtors said the Quang Ninh, especially Ha Long City, has emerged as an appealing destination for real estate investors. Endowed with natural advantages for sea and island tourism, Ha Long is not only an ideal tourist attraction but it is also a magnet for property investment. Many giant real estate developers like Vingroup, SunGroup, FLC, BIM Group and CEO Group are pouring more capital into this potential land. An array of real estate projects have cast a new look for the locality, including BIM Group’s 230-hectare Ha Long Marina urban area. The group earmarked 2 billion USD into the complex, which comprises Halong Marine Plaza shopping center, CGV cinema, children entertainment zone Tini World, beaches, pools, apartment blocks along with rows of shop houses and town houses. Meanwhile, the 214-hectare Sun World Ha Long Complex developed by SunGroup has become one of the main local tourist attractions. Riding a cable on a sea-crossing cable line or the 215m-high Sun Wheel in the complex, visitors can enjoy the view of Ha Long Bay, Ha Long city, Bai Chay bridge and Cuu Luc river from different angles. In addition, Sungroup has also built the Sun Premier Village Ha Long Bay, an area of town houses and villas, next to the complex. Real estate developer Vingroup has chosen to invest in different types of properties in Ha Long, ranging from healthcare, resort, shopping mall to new urban areas. Following the opening of its Vincom shopping mall in 2015, the group has poured over 12 trillion VND into the 64ha Vinhomes Dragon Bay urban area, 1.135 trillion VND in the 384-room Vinpearl Ha Long resort. The group is also building its trademark Vinmec hospital in the city. FLC Group has also given a facelift to the city with its FLC Ha Long complex with a golf course, villas, condotel and a modern international conventional centre spanning an area of 224 hectares in Hong Hai, Hong Ha, Ha Lam and Ha Trung wards. The group has set up plan to construct a 50-storey twin tower complex in the city’s center. Property experts said that the city will be turned into a resort paradise soon. According to local property trading floors, there were some 400 successful transactions in the first quarter of this year, 50 percent of which were the trading of apartments and the remainders were divided for shop house, villas and town houses. 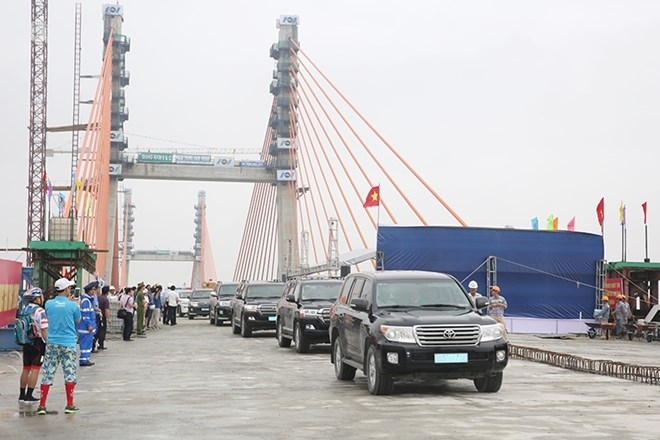 Recently, the final segments of the Bach Dang bridge connecting Ha Noi-Hai Phong expressway and Quang Ninh province were joined. Once completed, the bridge will give a new boost to transport infrastructure in Quang Ninh as travelling time from Hanoi to Quang Ninh by car will cut to only 90 minutes. The local property sector has taken off thanks to the development of transport infrastructure, said PhD Nguyen Huu Thuy, chairman of the provincial young business association. He noted that the capital flow from both domestic and foreign investors like Vingroup, SunGroup, Tuan Chau, Bimgroup, FLC and Texhong is vivid evidence for Quang Ninh’s attraction.